Danze Oil Rubbed Bronze Handheld Shower Head Slidebar Mount Wire Basket Shelves: This Danze Slidebar Mount Wire Basket Shelves is built to last. The highest quality standards are used to precision manufacturer a top of the line fixture. Important features of this 100% BRAND NEW Fixture: Complete Item! Everything necessary for installation is included. 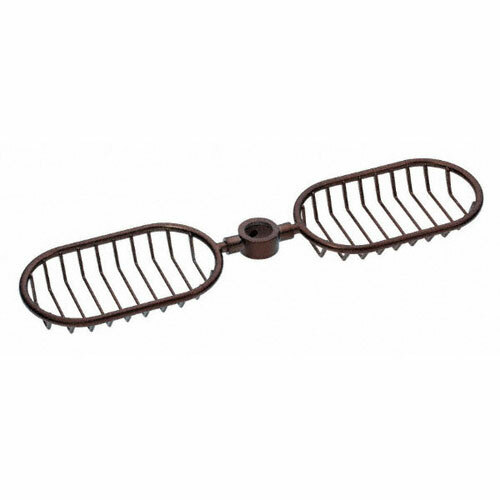 Oil Rubbed Bronze Wire Basket Shelves for Shower - Wire Shower Baskets - To complete your personal Shower setup, Danze offers a wide variety of useful Shower accessories. Consider our Danze wire Shower baskets. Installation is easy and they will work great with the Danze Versa 30 in. slide bar or the Danze 24 in. standard slide bar. - Generous basket space will hold multiple bottles of shampoo/body wash - All metal construction will provide durability - Oil Rubbed Bronze premier finish designed to resist fading and tarnishing. - Designed for use with 30 in. Versa slide bars or 24 in. standard slide bars - Oil rubbed bronze finish will give your bathroom that distinguished look - Matching Accessories Available - Easy to Install - Installation instructions included. This fixture is manufactured by Danze and is part of their Wire Basket Shelves collection.